I was recently shocked to notice that my last Scrabble blog entry was from way back in March when Chelsea, Virginia, and I won the Literacy Volunteer Scrabble Tournament HERE. I have actually played two games with Mara since then, but we talked about stuff that was either too personal or not blog worthy, so nothing got recorded. 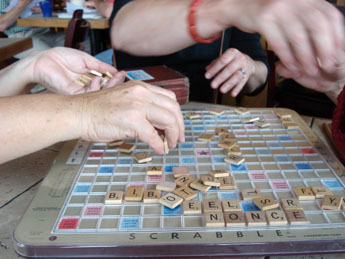 It was fun to get together with the Scrabble Bag Ladies of Café Del Sol this past Tuesday to play. We started outside on the new Winter Sun deck but got chased into the cafe by the summer sun. You can watch some past Café Del Sol Scrabble outtakes HERE, while I’m at the dentist getting bridgework done. Looks like you gals play a FAST game of Scrabble with everyone moving everything around all at once! Was this a set up???? It was a real game. I just snapped pictures while we were playing an cleaning up. I had not played Scrabble in years, but it was a treat earlier this summer to get out the tiles and have a go with my husband and sister-in-law. Now I’ve dug out my parent old original edition with the cloth bag and proper varnished tile-shelves and all I need is someone to play with. Boo hoo! 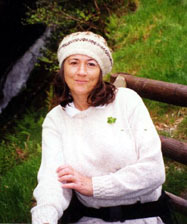 Colleen – stop by my blog to read my trilogy of animal-rescue stories in poetry. They’re a hit! – the play rw and ff I mean. hey! i’m commenting on this in between some lexulous games!